In one of the strangest challenges of the season, the Project Runway All Stars were tasked with creating an avant garde look using lights on a black lit runway this week. Creative? Yes. Odd? Most definitely. "When I Get My Dress in Lights" had me thinking more Judy Jetson than high fashion. LEDs, fiber optics, strings, pearl lights, fairy lights. You name it and it was being sewn into or onto a dress. As the designers scurried through a lighting store, it appeared everyone was going neon but Austin. Austin Scarlett does not do neon and for that, I'm grateful. Mondo lamented that Austin had become very high maintenance. Become? When was Austin ever low maintenance? And what was up with the case of the disappearing mustache? In one shot he's clean shaven, the next he's got a furry lip and then it was seen in several stages in between. How long did this episode take to film? But back to the workroom. Joanna Coles wandered in for another boring segment. Sigh. I have nothing against Joanna but this is the moment that always makes me miss Tim Gunn. Well, there's also his parting hugs. Joanna doesn't seem like much of a hugger. This week's guest judge was Pharrell Williams, who was once named the Best Dressed Man in the World but I couldn't tell from what he wore here: Faded jeans, a t-shirt, a brown sweater that looked like something my grandpa would wear and a ball cap that appeared a size too big. It didn't exactly scream high fashion but then Isaac's yellow polo shirt with the turned up collar was giving me early '90s flashbacks so maybe it's just me. 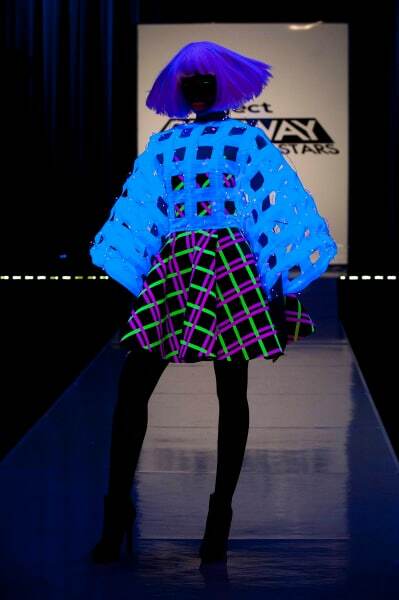 Kenly's dress was neon plaid made with light tape and a grid type jacket and yet it still looked very Kenly. Isaac's proud that she took his advice from last week and stretched herself. Angela loves the plaid made with tape but Pharrell thought the wires through the jacket looked cheap. Mondo's neon dress with what Pharrell called old Cadillac wings for breasts harkened back to the Tron movie. Although it reminded Isaac of the Teletubbies. He loves Teletubbies. Now I'm scared. Austin's look resembled a fairy from a heavenly galaxy. Pharrell and Isaac loved it. Georgina's enchanted but Angela wishes the lights were spread out more. Jerell was going for ethnic tribal but Georgina said it was more tribal rave. Isaac thought the accessories came out of a joke store instead of the Neiman Marcus wall. Honestly I thought she looked like a neon chicken. Michael's neon, ninja, warrior princess look was just a little too over the top but at least there was no draping this week. Isaac didn't like the tape or the bow on the back. Pharrell said it looked like it was made for ComicCon, not the runway. And the winner is... Austin! It always pays to stay away from neon. Escorted off the runway for good was Jerrell. Even with the black light his look didn't work. After this challenge I can't even imagine what they'll come up with next week but I"ll definitely tune in to find out.